Unlike yin-yang, the symbol of harmony between two opposites, the picture shown here is lacking obvious harmony. The left half, reminiscent of sun and water or blue sky, does not captivate my eye. By contrast, the dark half circle on the right with its light perimeter makes me think of a view through the Kuiper belt into the distant universe; 95% of the matter of the universe, dark energy & dark matter, not perceived by our senses; and neurons in our brains not utilized. The next image shows the painting with its proper orientation: The Swan, No 17. 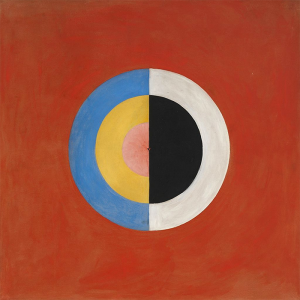 1915; 150×150 cm by Hilma af Klint, a Swedish Painter (1862 – 1944). Other af Klint paintings, currently on exhibit at the Guggenheim Museum, NYC, also have a ‘soft’ right and a ‘more solid’ left half. 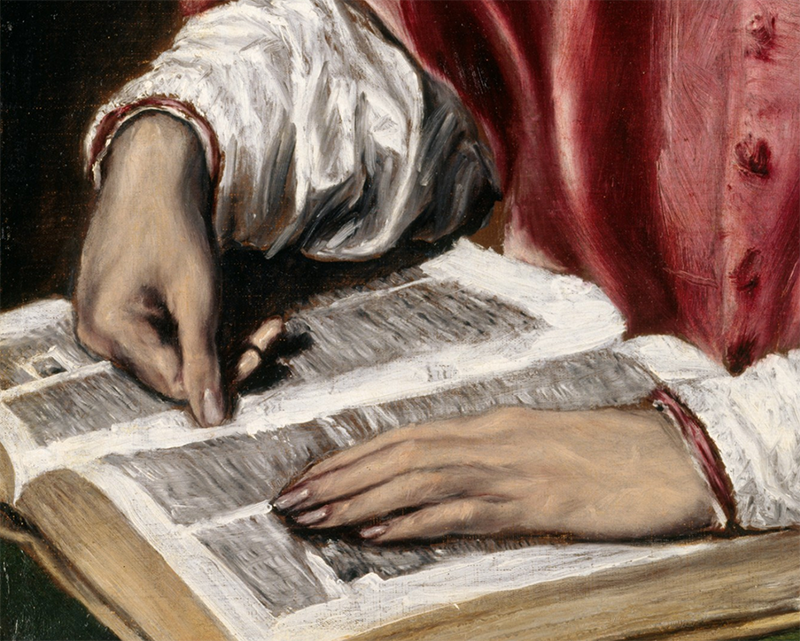 Why does viewing the painting in its proper orientation make me feel uncomfortable while I love looking at it horizontally rotated? Hilma af Klint studied at the Royal Academy of the Fine Arts in Stockholm. During her life, she was known as painter of landscapes, portraits and botanical art. 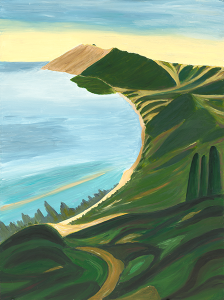 Privately, inspired by mysticism, she started painting ‘abstract art’ in 1906, novel for Europe and Russia but practiced in other parts of the world such as in Australia by Aborigines. 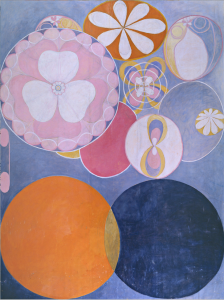 During the next two years, af Klint painted large organic forms and mandelas in which blue, yellow and pink/red stood for female, male and sensual/ spiritual love, respectively. But in 1908, she stopped painting for four years. — After her amorous affair with Dr. Helleday, she decided to remain single. She took care of her mother who went blind. She gave up or changed her studio (different accounts). During those dry 4 years, she met Rudolf Steiner, a theosophical colleague, who advised to hide her abstract art for the next 50 years. 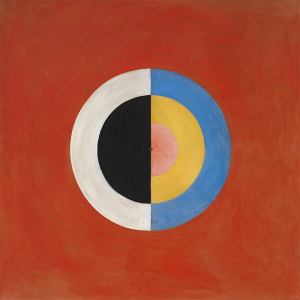 From 1912 – 1915, af Klint again painted abstract art but now in a more authoritative, geometric style. She executed “Paintings for the Temple’, a task commissioned by a spirit whom she called Amaliel. Other severely geometric paintings are the ‘transcendent’ swan series, among them the picture discussed at the beginning of this post. 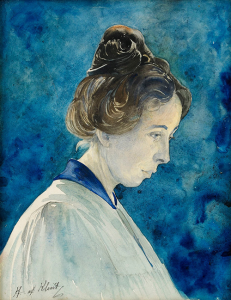 Subsequently af Klint dedicated herself more fully to studying theosophy and anthroposophy. Later, after reading Goethe’s color theory, af Klint painted with water-color, wet-on-wet, allowing the colors to flow into one another, very different from her earlier botanical paintings. At the beginning of the 20th century esoteric spiritualism was also practiced by Kandinsky (1866-1944), Malevich (1879-1935), and Mondrian (1872-1944), other painters of abstract art. Emotional responses to colors. Different artist imbue colors with different symbolism. Interestingly, Hilma af Klint and Franz Marc (1880-1916) associated blue with their own gender and yellow with the opposite gender. 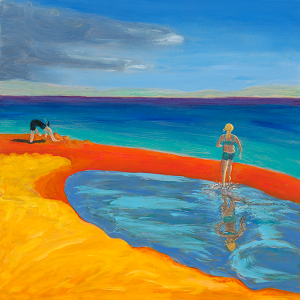 My painting ‘Beach Play” was exhibited at the Glen Arbor Art Association in Michigan. “it reminds me of Dali’s floppy watches”. 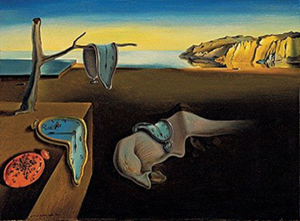 Salvatore Dali’s painting (9.5 in × 13 in) of floppy watches entitled ‘Persistence of Memory’ can be viewed at the Museum of Modern Art, NYC. 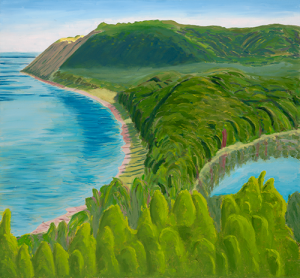 Thinking about a possible relationship, I can modestly say that many of Dalí’s paintings were inspired by his Catalonia landscapes, similarly, many of my paintings are inspired where I spent much of my year – the Sleeping Bear Dune, a National Seashore on Lake Michigan. 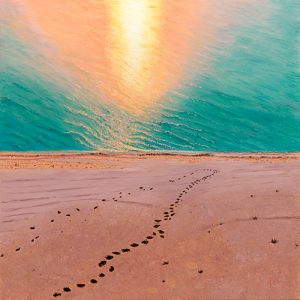 My oil painting is small too, just 12 x 12 inches on a wooden panel. Viewing my painting here, which of the comment above, if any, do you relate to? 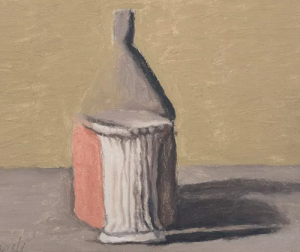 Experiencing both the dying of a friend and of a colleague this summer, reminded me of Morandi’s paintings during the last few years of his life. 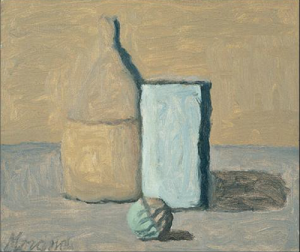 Morandi (1890 – 1964) was an Italian painter and printmaker noted for his still lifes. He painted vessels made for everyday use such as bowls, jars, bottles, jugs, cups, vases. 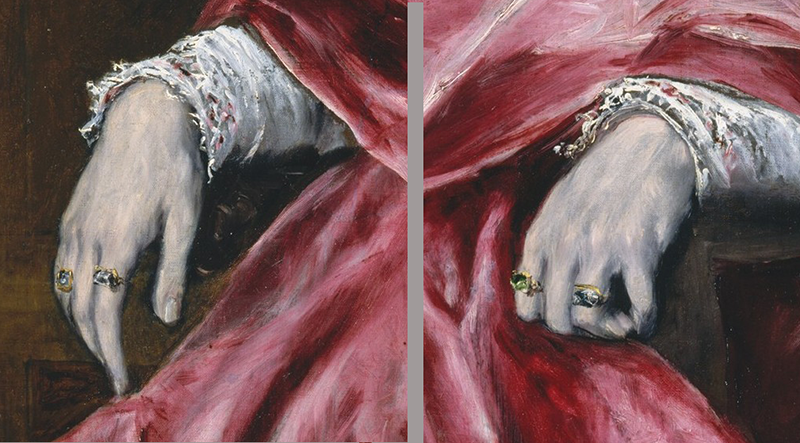 One can recognize the same vessels from painting to painting, differing in their geometrical arrangements and the tonal subtlely of their colors. Shadows gives these vessels a spatial context. What struck me was the appearance of dissolving boundaries of the vessels painted during the last few years of Morandi’s life. In a 1960 painting, the top left of the tall vessel is barely distinct from the background. In a 1963 painting , an excerpt shown here, the top left of the tall vessel only shows a faint delineation from the background, barely noticeable in this small photo. Note that the colors are becoming more mute. 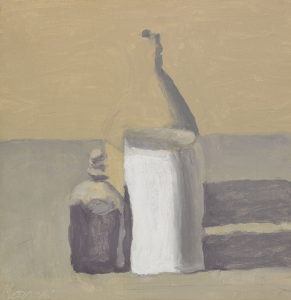 In a 1964 painting, the year Morandi died, the left top of the tall vessel fully merges with the background. At an exhibition of this still life at the MET, a note next to it showed a comment Morandi made before his death which went something like this ‘I still have so many of my ideas to realize‘. Dissolving boundaries are also apparent in the last painting by Gustav Klimt (1862 – 1918), an Austrian symbolist painter, done half a century earlier. His painting, now called the ‘Tänzerin’ (Dancer), is reputed to have been begun as a commission in 1916 to memorialize a daughter who had committed suicide. But the parents rejected their commmissioned painting. Shortly before his death in 1918, Klimt altered the painting to show a young woman with bare breasts. Note that the flowers of the girl’s skirt are merging with the flowers of the background. 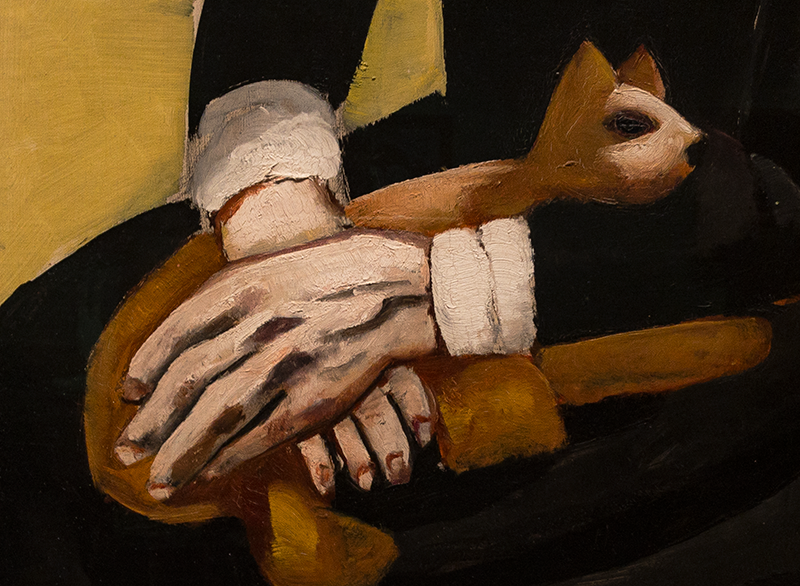 This painting can be seen in the Neue Gallery, NYC. Rather than denoting the imminent death of the painter, Otto Dix‘s painting coincides with the death of a civilization. Otto Dix (1891 – 1969) taught at the art academy in Dresden but lost his job in 1933 when the Nazis came to power. His work was exhibited by the Nazis together with that of other German artists as ‘entartete Kunst’ (degenerative art). Together with Georg Grosz, Dix was a representative of the Weimar Republic movement ‘Neue Sachlichkeit’ (new objectivity) following German Expressionism. Unlike Grosz who emigrated to the USA, but like Jeanne Mammen, Dix went into an inner emigration and survived economically with commissioned work by friends. 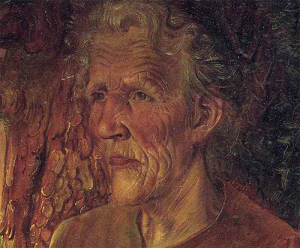 In his 1935 painting Mother and Eva, the mother’s deeply wrinkled face resembles the bark of the tree. The face merges with the tree. Mother, during the death of the vibrant civilization in Germany, looks into the distance, rather than relating to the child, the rosy-faced Eva, not shown in this excerpt.